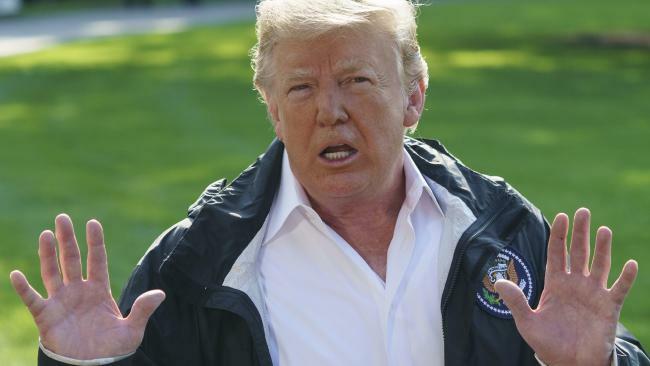 DONALD Trump has been ridiculed for his response to Hurricane Florence, which he called "one of the wettest we have seen from the standpoint of water". Mr Trump has visited the Carolinas to survey the flood damage, posing for photos outside wrecked homes and walking streets strewn with trees and furniture. The President hugged residents, shook hands with volunteers and offered encouraging words to storm-ravaged neighbourhoods. "How's the house?" he asked one resident, as he helped hand out hotdogs at a church in North Carolina. "You take care of yourself." As he arrived in the coastal town of New Bern, his motorcade passed over a swollen river with busted docks and broken boats, one washed up against a hotel. The death toll from the hurricane has risen to at least 37, including two women who drowned when a sheriff's van taking them to a mental health facility was swept away by floodwaters. At the Marine Corps Air Station in Cherry Point, Mr Trump stressed that the flooding had been severe, despite the sunshine. "Some of the flooding is actually epic. Hard to believe," he said. "We've done a real job, and we'll continue to do a real job," he added, insisting "there will be nothing left undone" although it would probably be "rough two weeks." I just drank a glass of water and I swear that was the wettest water I ever drank from the standpoint of water. He always sounds like he's giving a book report for a book he didn't read. In a video posted on his Twitter account on Tuesday local time, the President tells the camera: "This is a tough hurricane, one of the wettest we've ever seen from the standpoint of water. Rarely have we had an experience like it, and it certainly is not good. "But the people of North Carolina, South Carolina, Virginia, all the areas affected, you've been incredible. There's been a loss of life and may God be with them and their families. That's a tough one, it's tough to understand but this has been a really difficult time for a lot of people. He thanked law enforcement, the military, the coastguard, FEMA and everyone involved for their efforts in helping with the recovery effort. "Florence has been a nasty one, a big one," he added. It came after he warned that the hurricane would be "tremendously big and tremendously wet" in the lead-up to the storm. Nobody knew that talking about the weather would be so hard. “One of the wettest we’ve seen from the standpoint of water.” What? What else could it be from the standpoint of? Oil? Social media users were bemused, calling his comments "utterly moronic" and suggesting "a classroom of second graders could have written a more thoughtful and coherent statement". Some said they preferred "a drier water" or agreed it was "very wet, in terms of water." One Twitter user observed: "Trump trying to be empathetic is not unlike a dog trying to solve a Calculus problem." Another added: "I... really can't believe this dude is trusted to cross the street by himself let alone run a country." "Hurricanes have water, water is wet, and this is bad," said another.